If you’re thinking about driving a new car under a contract hire or car lease agreement then a new government campaign is urging you to consider an ultra-low emission vehicle. The Deputy Prime Minister has teamed up with the UK car industry to launch the ‘Go Ultra Low’ initiative which aims to get more drivers to consider low emission vehicles when choosing their next car leasing deal. 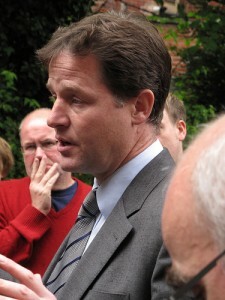 Nick Clegg has joined some of the car industry’s biggest names to launch ‘Go Ultra Low‘, a year-long awareness campaign. The aim of the initiative is to help motorists understand the benefits, cost savings and capabilities of the range of ultra-low emission vehicles on the market. BMW, Nissan, Renault, Toyota and Vauxhall have backed the campaign, which aims to prompt car buyers to consider the benefits of pure electric, plug-in hybrid and extended-range vehicles. A new website provides information about their low running costs and the locations of the thousands of accessible charging points across the UK. In the last three years alone, almost 20 electric and plug-in cars and vans have been launched in the UK. Considering the average UK journey being less than 50 miles, the ‘Go Ultra Low’ campaign will encourage car leasing and contract hire customers to opt for cars with either zero, or less than 75g/km of CO2 emissions. As well as a brand new website, the campaign will see national print advertising, a radio advertising campaign, online community campaigns and fleet partnerships throughout 2014. The government is also backing the scheme with investment, as we see next. The Deputy Prime Minister, Nick Clegg MP, said, “Electric cars are one of the most promising of our green industries and we want to secure the UK’s position as a global leader in both the production and adoption of these vehicles. This entry was posted in Eco Car, Electric Cars, Low Emissions Cars, News and Views and tagged bmw, co2 emissions, go ultra low, low emission vehicles, low emissions, nissan, renault, toyota, ultra low, vauxhall by David Petherick. Bookmark the permalink.